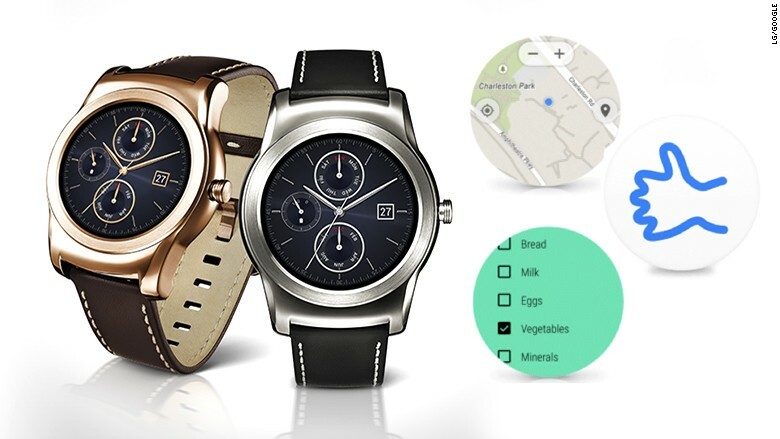 Google is updating its Android Wear smartwatch software ahead of the Apple Watch launch. With just four days until the Apple Watch is finally available, Google is reminding the world that it has smart watches too. With built-in Wi-Fi support, an Android Wear watch will gain a bit of independence from its counterpart, the smartphone. Even if there's no phone nearby, a watch can connect to any available Wi-Fi network (if it's been set up using a phone previously) and get notifications, send and receive messages, and use Wi-Fi dependent apps. Android Wear already includes an always-on black-and white display to show the time. Now it will let third-party developers tap the low-power feature to keep their screens on as long as they like. To see the time on an Apple Watch, you have to move your wrist to turn the display on, which is its way of saving power. Complex communications are hard on tiny watch faces, so Google is adding a doodle-to-emoji translator. Do your best drawing of a happy face, cat, or thumbs up and it will turn it into the emoji equivalent. Other new features include the ability to pull up a list of all installed apps with a swipe, and flicking your wrist to advance through news or notifications instead of scrolling with a finger. The update will be available in the coming weeks on the Android Wear models currently available from Asus, Samsung, LG, Motorola, Sony and Huawei. First it will ship on the new LG Watch Urbane model that comes out on Friday. The new features won't necessarily be available on every watch. The hardware will have to support it and each manufacturer will decide what updates to allow.